The extent to which neuroscience can at least potentially explain religious belief and experience has been understood in different ways. A survey and personal evaluation by Warren Brown, which the ISSR Executive Committee believes provides a good starting point for further study, may be read here. Why study religious thought, experience, and behavior from the standpoint of neuroscience? What might be the goals of such research? Broadly, there are four objectives reflected in the body of research currently available. First, there are those who search for uniquely religious neurophysiology, all the way from the level of brain structure (a “God module”) to the search for a specific gene that codes for religiousness. The assumption is that religiousness is a human capacity like language, with focal areas of brain processing (like Broca’s area) and a necessary genetic code that supports its development. A second approach is to search for a broader interactive pattern of brain activity that is unique to religious experience or religious thought. Functional brain imaging (i.e., functional MRI, Single Proton Emission Computed Tomography, and Positron Emission Tomography) generally reveals that any particular sort of mental event is characterized by a pattern of greater or lesser neural activity across a number of cortical and subcortical brain areas. For example, contemplating a difficult moral dilemma involves a network of activity including the lateral parts of the frontal lobes and several parts on the midline of the cerebral cortex.2 While these networks are overlapping with networks associated with other sorts of mental processing, it is presumed that each type of mental processing will have a distinctive pattern. This research assumes that religiousness is a singular sort of mental event with a particular identifiable pattern of brain activity that is the “signature” of all religious experience or thought. Both the objective of identifying a unique pattern and that of finding a specific structure or gene presume that religion is a distinct type of cognitive event that is unlike all other cognitive events, and the same in all persons, religious contexts, and cultures. A more sophisticated form of the neuroscience of religion is study of a wide variety of forms of religious thought, experience, and behavior, documenting what is the most consistent pattern of brain activity associated with each particular form of religious mental activity. How do particular religious activities affect neural functioning (i.e., prayer, meditation, chanting, singing, contemplating the truth of propositions or moral dilemmas)? Comparisons are then made between the pattern of brain activity associated with a particular form of religious behavior and similar patterns from not-explicitly-religious mental, experiential, or behavioral states. Here the question is, What more general form of human mental activity is engaged in this particular form of religiousness? There is no assumption that religiousness is either singular or unique from the standpoint of neural systems, but rather that it shares neurocognitive modes with other forms of human thought, experience, and behavior. Finally, there are neuroscientific questions regarding the impact of normal or abnormal changes in neurophysiology on religious experiences, thought, or behavior. For example, what are the effects on various forms of religiousness of changes in the nervous system due to abnormal genetics or epigenetics, hormonal changes, drugs, or diseases and trauma. Here the question is not so much about finding specific brain patterns associated with religiousness, but rather understanding how changes that impact the nervous system modulate the experiences and expressions of religiousness. With these very broad perspectives on the aims of a neuroscience of religion, we turn now to a brief survey of some of the current work in which a number of methods of neuroscientific research have been directed toward the study of religiousness. Genetics of Religiousness: A number of studies have suggested that religious tendencies are related to our genetic endowment. Twin studies, like the University of Minnesota twin studies3, suggest that there is a genetic contribution to the likelihood of church attendance or the tendency to have self-transcendent experiences.4 Consistent with these twin studies, studies comparing actual genes and behavior have found a correlation between the presence of a gene variant called VMAT2 and a self-report test of self-transcendence.5 The presence of this gene was significantly correlated with the subscale of the test measuring “self-forgetfulness”, but was less well correlated with scales involving transpersonal identification or mysticism. A similar correlation has been found between measures of self-transcendence and a genetic marker for the dopamine transport molecule. 6 One geneticist claimed that such results are an indication of genetic determination of brain wiring specifically subserving religiousness.7 However, there is nothing in the measures that might not also be related to non-religious self-transcendence or self-forgetfulness in other domains of life, and it is as yet unknown all that these genes might influence in other non-religious psychological and social domains. Although such cases are rare, they are sufficiently frequent to provide speculation regarding the brain processes that may be associated with more normal sorts of intense religious experiences. For example, these sorts of clinical reports have led one neuroscientist to speculate regarding the possible existence of a “God Module” in the brain – that is, “dedicated neural machinery in the temporal lobes concerned with religion.”14 However, others do not believe the accounts support this conclusion, but rather suggest a “limbic marker hypothesis” such that the limbic structures of the temporal lobe that are involved in the seizures serve to tag information as “crucially important, harmonious, and/or joyous, prompting comprehension of these experiences within a religious framework.”15 As in the case of hallucinogenic drugs, it may be more the attributions provided by the patient, rather than the abnormal brain activity itself, that makes the experience seem religious. Reduced levels of religious experience have been found in other neurological disorders. One study found reduced intensity and frequency of self-reported religiosity in individuals with Parkinson’s disease, as well as diminished engagement in the private practices of religion (e.g., prayer, meditation, devotional reading). This reduced religiosity in Parkinson’s patients was correlated with neuropsychological measures reflecting functioning of the prefrontal cortex. These results suggest that low dopamine in limbic-prefrontal circuits (characteristic of Parkinson’s patients) reduces motivational support for religious practices. Magnetic Brain Stimulation and a “Sense of Presence”: One can experimentally manipulate the neural electrical activity of the brain using Transcranial Magnetic Stimulation (TMS). In one experiment, TMS applied over the right temporal lobe in non-epileptic individuals resulted in reports of a “sense of presence” which was described religiously by some (e.g., as the presence of God or angels).17 This study drew the conclusion that all religious experiences must be the result of abnormal activity (“microseizures”) of the right temporal lobe. However, other studies found no evidence that TMS of the right temporal lobe increased reports of sensed presence or mystical experiences either in the entire group or in individuals high in suggestibility.18 When religious experiences were reported in this study they were related to situational priming or prior religious schemas. Neuroimaging during Religious States and Experiences: Neuroimaging (including fMRI, PET and SPECT scanning) allows researchers to observe patterns of ongoing brain activity in living persons in a noninvasive way. This technology is currently being used to study domains of human mental life that go beyond basic cognitive processes (such as memory, language, problem-solving, etc.). A large literature is accumulating that reports neuroimaging studies of deeply meaningful forms of human thought and behavior, such as interpersonal interactions (social neuroscience), economic decision-making (neuroeconomics), moral deliberations (moral neuroscience), and religious states and experiences. Early well-publicized work used SPECT scans to observe brain activity during meditation in both Buddhist monks and Catholic nuns. 18 The results showed that meditation was associated with increased bilateral frontal lobe activation, and decreased right parietal lobe activity. Decreased activity of the right parietal lobe was interpreted as a neural correlate of the absence of a sense of self as the meditator achieved a state of “oneness”. These same investigators subsequently reported brain activity associated with the ecstatic religious state of glossolalia (speaking in tongues). Compared to singing gospel songs, glossolalia was accompanied by decreased activity in the frontal lobes (consistent with the self-report of loss of intentional control of behavior) and increased activity in the left superior parietal area, as well as decreased activity in the left temporal pole and left caudate nucleus. The changes in the frontal and parietal lobes are generally opposite to those seen during meditation. Other investigators have used Function Magnetic Resonance Imaging (fMRI) to study different forms of prayer. Compared to reciting formalized prayers, improvised praying was associated with activation of areas involved in social cognition (i.e., temporal lobe, medial prefrontal cortex, temporal-parietal junction, and precuneus). The authors concluded that this form of prayer engaged systems involved in interpersonal interactions.20 Another study observed brain activity (fMRI) while religious and non-religious persons judged the truth or falsity of religious and non-religious statements of belief. It was found that, in both groups, statements judged to be true (whether or not they were religious statements) elicited significantly greater activation of the ventromedial prefrontal cortex, an area associated with emotional associations, self-representation, and goal-driven behavior. Since activation was stronger for religious than non-religious beliefs, it was concluded that religious belief involves greater engagement of brain regions more generally involved in emotion, self-representation, and cognitive conflict. Taken together, current neuroimaging studies suggest that religious states and beliefs are associated with identifiable changes in the distribution of brain activity, and that different religious states are associated with different patterns of brain activity – in some cases quite opposite patterns. Most importantly, religious mental and experiential phenomena do not engage a single brain area, nor are they are unique sorts of brain events, but involve patterns of brain activation found also in other forms of human cognition and subjective experience. This review of some of the current research on the neuroscience of religious experience, belief, and behavior, while painting a broad-brush picture of the field, nevertheless makes apparent a number of philosophical and theological issues, such as: Are humans merely physical? What is the nature of human religiousness? Can religious life be reduced to nothing but the physical? Is religion a product of biological or cultural evolution? What does all of this say about the veracity of theism? In what follows, a few of these important issues are described and some cursory reflections offered. In each case, pointers to further reading are provided for those interested in pursuing these questions. Reductionism versus Emergentism: If embodied, is religiousness therefore nothing more than mere neurophysiology? Is the brain itself a sufficient cause of religious experience or religious belief? If so, then causes in the brain might be reducible to neurons, and neurons to neurochemistry, and neurochemistry to atomic and subatomic physics. If all the ultimate causes lie at the level of atoms (or even complex molecules like genes) then religion is indeed nothing but physiology. This is what is meant by reductionism. The heart of this problem revolves around the appropriate level of complexity and organization at which the idea of a cause can be attributed within very complex, hierarchical systems like human physiology. The Multifaceted Nature of Religion: Another way that reductionism has at times played a role in the neuroscientific study of religion is the tendency to reduce religion to one or two dimensions, such as mystical experiences or meditative states. This view conveniently disregards the fact that there is so much more of human life that expresses itself as religiousness: beliefs, daily practices, ritual observances, subjective experiences, attitudes toward things like wealth or illness, understanding of social relations, and worldviews. In fact, the meditative states and mystical experiences that are often the focus of neuroscientific research are rare in most religious persons, and thus encompass a very small percentage of human religiousness. The Veracity of Theism: One final comment should be made with respect to the neuroscientific study of religiousness and the truth or falsity of theism. It was stated earlier in this essay that neuroscientific research cannot either prove or disprove the idea of the existence of a soul or spirit, but that a theological anthropology that takes into account research on the embodiment of the many complex aspects of human religiousness would be more robust. Similar statements can be made with respect to belief in a divine being. Theism cannot be proved or disproved by neuroscientific study of the embodiment of human religiousness. 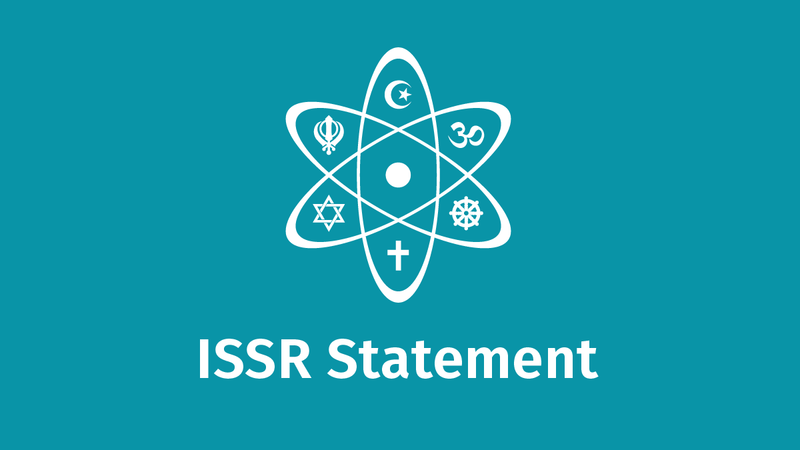 However, one of the main objectives of ISSR is to promote conversations between theologians and scientists in the belief that this will allow a deepening of theological thinking when it takes into account the outcomes of modern scientific research. I have written with Malcolm Jeeves a broader and more extensive treatment of this topic, Neuroscience, Psychology and Religion; see the list of Further Readings. Neils G. Walker, Brian A. Kojetin, Thomas J. Bouchard, David Lykken, and Auke Tellegen (1990).” Genetic and environmental influences on religious interests, attitudes, and values: A study of twins reared apart and together.” Psychological Science VOL 1138-42. See also Lindon Eaves, “Genetic and social influences on religion and values” in Malcolm Jeeves, From Cells to Souls – and Beyond: Changing Portraits of Human Nature (Grand Rapids, MI: Eerdmans, 2004), pp. 102-122. Genetic contribution in twin studies is concluded when the concordance between identical twins who share 100% of genetic inheritance is much greater than that of fraternal twins who only share 50% of their genes. Dean Hamer, The God Gene: How Faith is Hardwired into Our Genes (New York: Doubleday, 2004). Comings, D. E., N. Gonzales, G. Saucier, J. P. Johnson, and J. P. MacMurray. 2000. “The DRD4 gene and the spiritual transcendence scale of the character temperament index.” Psychiatric Genetics 10 (4):185-9. A good summary of this information can be found in David E. Nichols and Benjamin R. Chemel, “The neuropharmaology of religious experiences: Hallucinogens and the experience of the divine.” In Patrick McNamare (ed) Where God and Science Meet: Vol. 3: The Psychology of Religious Experience (Westport Conn.: Praeger, 2006), pp. 1-34. Borg, J., Andrâee, B., Soderstrom, H., & Farde, L. (2003). The serotonin system and spiritual experiences. Am J Psychiatry, 160(11), 1965-1969. Nichols and Chemel op. cit., p.3. Malcolm A. Jeeves and Warren S. Brown, Neuroscience, Psychology and Religion: Illusions, Delusions, and Realities about Human Nature. (Radnor, Penn: Templeton Press, 2009), pp. 94. Naito, H. and Matsui, N. “Temporal lobe epilepsy with ictal ecstatic state and interictal behavior of hypergraphia.” Journal of Nervous and Mental Disease. 1988, 176(2):123-4. Ramachandran, V. S. et al., (1997) “The neural basis of religious experiences,” Society for Neuroscience Conference Abstracts, p. 1316. A similar conclusion can be found in Joseph, R. “The limbic system and the soul: Evolution and neuroanatomy of religious experience,” Zygon. 2001, 36:105. Saver, J.L. and Rabin, J. (1997). “The neural substrates of religious experience.” Journal of Neuropsychiatry, 9: 498-510. B.K. Puri, S.K. Lekh, K.S. Nijranc, M.S. Bagary, & A.J. Richardson (2001), “SPECT neuroimaging in schizophrenia with religious delusions”, International Journal of Psychophysiology. 40: 143-148. Persinger , M.A., Makarec, K. (1987). “Temporal lobe epileptic signs and correlative behaviors displayed by normal populations.” Journal of General Psyhcology. 1114: 179-195; and Persinger , M.A., Makarec, K. (1993). “Complex partial epileptic signs as a continuum from normals to epileptics: Normative data and clinical populations.” Journal of Clinical Psychology 49: 33-45. Granqvist, P., M. Fredrikson, P. Unge, A. Hagenfeldt, S. Valind, D. Larhammar, and M. Larsson. (2005). “Sensed presence and mystical experiences are predicted by suggestibility, not by the application of transcranial weak complex magnetic fields.” Neuroscience Letters, 379 (1):1-6; and Granqvist, P., and M. Larsson (2006). “Contribution of religiousness in the prediction and interpretation of mystical experiences in a sensory deprivation context: activation of religious schemas.” Journal of Psychology 140(4):319-27. Newberg, A., Alavi, A., Baime, M., Pourdehnad, M., Santanna, J., and d’Aquili, E. (2001) “The measurement of regional cerebral blood flow during the complex cognitive task of meditation: a preliminary SPECT study.” Psychiatry research. 2:113-22. Schjoedt, U., H. Stødkilde-Jørgensen, Hans, Geertz, Armin W., Roepstorff, Andreas (2009). “Highly religious participants recruit areas of social cognition in personal prayer.” Social Cognitive and Affective Neuroscience, 4(2): 199-207. Nancey Murphy and Warren S. Brown, Did My Neurons Make Me Do It? : Philosophical and Neurobiological Perspectives on Moral Responsibility and Free Will (Oxford, U.K.: Oxford University Press, 2007). Warren S. Brown “The Brain, Religion, and Baseball: Comments on the Potential for a Neurology of Religion.” In P. McNamara (Ed. ), Where God and Science Meet: How Brain and Evolutionary Studies Alter Our Understanding of Religion; Volume II: The Neurology of Religious Experience. (Westport, CT: Praeger Publishers, 2006). René Girard, Des choses cachées depuis la fondation du monde. (Paris: Grasset, 1978) Translated into English as Things Hidden since the Foundation of the World: Research undertaken in collaboration with J.-M. Oughourlian and G. Lefort. (Stanford: Stanford University Press, 1987). Albright, Carol and James Ashbrook. Where God Lives in the Human Brain. (Sourcebooks, Naperville Ill., 2001). de Waal, Frans. Good Natured: The Origin of Right and Wrong in Humans and other Animals. (Cambridge Mass., Harvard University Press, 1997). Foster, Charles. Wired for God: The Biology of Spiritual Experience. (London: Hodder & Stoughton, 2010). Girard,René, Des choses cachées depuis la fondation du monde. (Paris: Grasset, 1978) Translated into English as Things Hidden since the Foundation of the World: Research undertaken in collaboration with J.-M. Oughourlian and G. Lefort. (Stanford: Stanford University Press, 1987). Gould, Steven J. Rocks of Ages. (New York: Ballantine, 1999). Hamer,Dean The God Gene: How Faith is Hardwired into Our Genes (New York: Doubleday, 2004). Jeeves, Malcolm. From Cells to Souls – and Beyond: Changing Portraits of Human Nature (Grand Rapids, MI: Eerdmans, 2004). Jeeves, Malcolm and Warren S. Brown Neuroscience, Psychology and Religion: Illusions, Delusions, and Realities about Human Nature. (Radnor, Penn: Templeton Press, 2009). Spanish translation: Neurociencia psicología y religión: Illusiones, espejismos y realidades acerca de la naturaleza humana. (España, Editorial Verbo Divino, 2010). Markam, Paul N. Rewired: Exploring Religious Conversion. (Eugene, OR: Pickwick Publications, 2007). McNamare, Patrick (ed) Where God and Science Meet: How Brain and Evolution Studies Alter our Understanding of Religion. (Westport Conn. Praeger, 2006). Murphy, Nancey. Bodies and Souls, or Spirited Bodies? (New York: Cambridge University Press, 2006). Murphy, Nancey and Warren S. Brown. Did My Neurons Make Me Do It? Philosophical and Neurobiological Perspectives on Moral Responsibility and Free Will. (Oxford, U.K., Oxford University Press, 2007). Ward, Keith. Religion and Human Nature. (Oxford: Clarendon Press, 1998).